“The identity of Tamils in the island is not Sri Lankan. For over half a century the Sinhala chauvinists constantly staging devil dance tell that the identity belongs only to the Sinhalese. A Tamil who has ancestry in the island has no choice other than claiming for the identity Eezhath-thamizhan in the international arena. If that identity is not there he has neither face nor name,” Es Po wrote in a foreword he gave to a poetry collection published in December 2009. He strongly condemned the role played by New Delhi in the genocidal war against Eezham Tamils. He was a pioneer in Eezham and in Tamil Nadu in what is today called Dalit literature, but Es Po never claimed it. 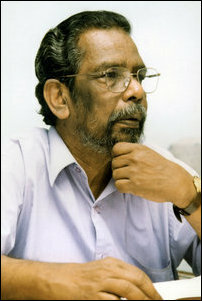 He was a trend setter among Tamil writers and wrote on many topics considered taboo by others at that time. His language was refreshing and excelled in introducing new words and ways of writing in Tamil. In his orientation he was a Marxist. But, he strongly differed from the Communist Establishments and their outfits of his times. Es Po was teaching in Eezham and in Nigeria before moving to Australia. While in Eezham, he was mostly teaching in Batticaloa, where he got married and settled. Authoring more than 40 books, Es Po also wrote a 2000-page autobiography, “Varalaattil Vaazhthal,” on his times and his literary mission. Collation of his articles and interviews has appeared as a book under the title “Ini Oru Vithi Cheyvoam”. He was equally at ease in English and has translated novels of some famous African writers when he served as an English teacher in Nigeria. For many years, he was running a publishing house “Mithra” in Chennai which has brought out many publications of Eezham Tamils. He was a patron, guide and inspiration to many young Tamil writers.